The men of the 4th Cohort of Dalmatians were a long way from home. They were undoubtedly cold and Hardknott Fort, which the Romans probably knew as Mediobogdum, must have seemed like the end of the world. Certainly, situated in the mountainous northern region of the most northerly province of Imperial Rome, it was one of the most remote postings in the Empire. Today, it is in the English county of Cumbria, on the edge of the Lake District National Park. 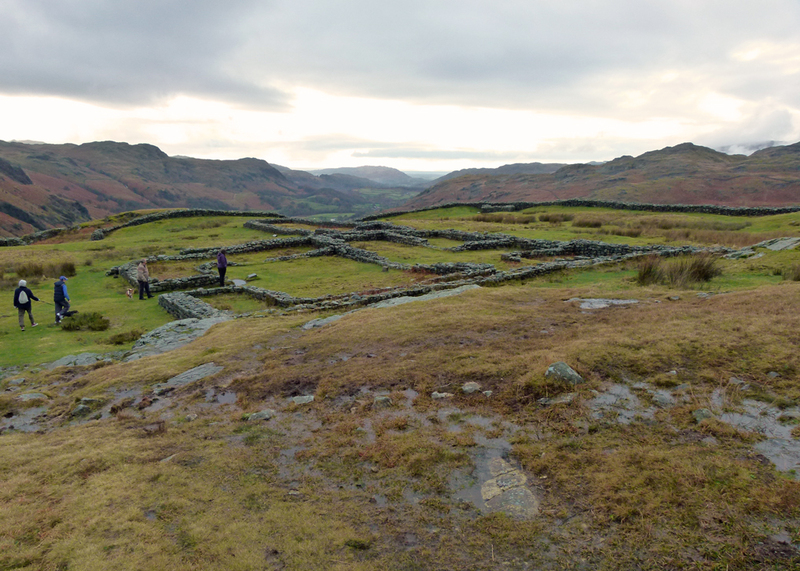 But the approach was the same 1800 years’ ago as it is now – either east from the port Glannaventa (Ravenglass) or west from the fort at Galava (Ambleside), a hard trudge through tough terrain. The Dalmatians, who came from the eastern Adriatic (modern Croatia, Albania, Serbia, Bosnia, Herzegovina and Montenegro), have left little trace of themselves at the fort they built sometime between 117 and 122AD, during the reign of Emperor Hadrian. They were a 3–4 month march away from their homes, but most of them are unlikely to have ever seen their families again anyway; the standard length of military service at this time was 25 years. 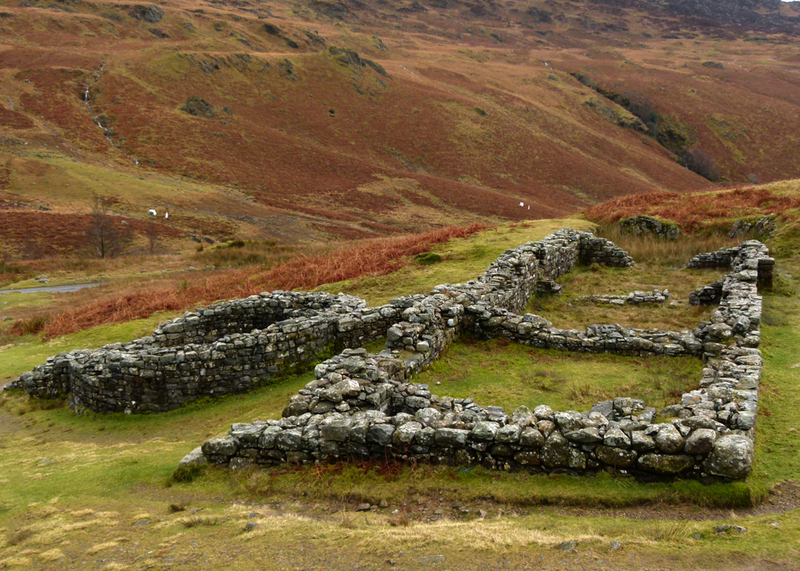 Hardknott was constructed of local stone, as well as red sandstone and timber that the soldiers would have hauled up from the coast. The invading Romans had pushed into northern Britain by the latter part of the 1st century, but not all native Britons submitted easily and the early 2nd century was a violent time. Forts were situated at key points along the roads built by the invaders, to facilitate the defence of their new possession and ensure the safe passage of goods. To secure northern Britain (modern northern England), the Romans had to subjugate the dominant tribe in these parts, the Brigantes, and possibly a sub-tribe of the Brigantes, the Carvetii. Many believe that Glannaventa – Ravenglass – was both a Roman naval base and the main port for the north of the province, where produce from throughout the Empire would have landed. 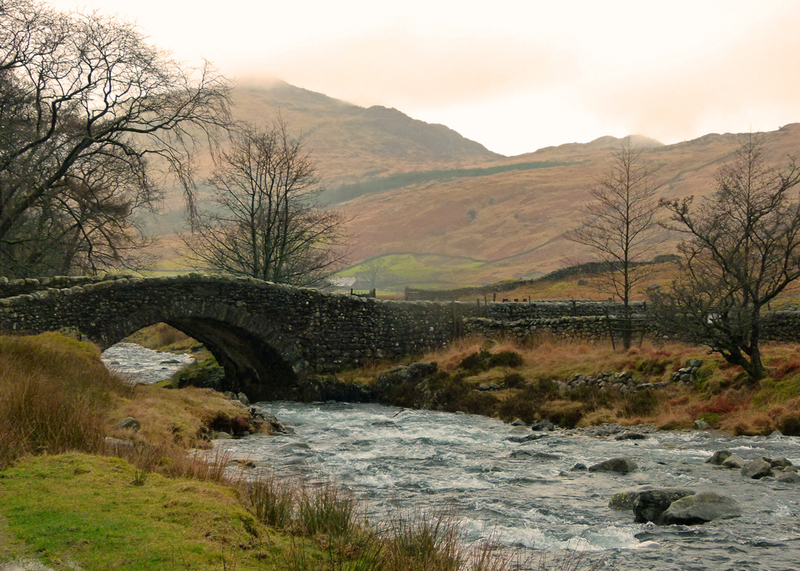 So Hardknott’s commanding location above the valley of the River Esk guarded an important trade route. The route was called the X Iter (10th Itinerary) and stretched 150 miles connecting forts and settlements from Glannaventa through Mediobogdum and Galava, on to Alavana (Watercrook, Kendal), Calacum (Burrow in Lonsdale), Bremetenacum (Ribchester, Lancashire), Coccium (Wigan? ), Mamucium (Manchester), Condate (Northwich, Cheshire) and Mediolanum (Whitchurch, Shropshire). We don’t know how long the 500 or so men of the 4th Cohort of Dalmatians stayed, or who replaced them, but it is thought Mediobogdum was vacated during the Roman incursion into Caledonia (modern Scotland) in the late 130s/early 140s. It was regarrissoned later in the 2nd century and then abandoned in the early 3rd century, its gradually decaying structure providing shelter for passing travellers heading over the pass. The reason for its abandonment is not known, but perhaps this part of Britain was at peace; or perhaps the garrison was needed elsewhere. By the early 5th century, Roman rule had petered out and warlords filled the vacuum in many parts of Britain. In time, this place became known as Hardknott, a name given by later Norse settlers to a nearby hill – harthr (hard), knutr (craggy hill). Roman forts were normally constructed on a standard design. This was a highly efficient process; everybody knew what to do – and it saved a fortune in architects’ fees. At Mediobogdum can be seen the stone outline of the Horrea – granaries, which had raised floors so that air could circulate and reduce the risk of infestation; the Principia, or headquarters, which would have included administrative offices and a temple; and the Praetorium, the commander’s residence, which was unfinished. Building on this rocky and uneven ground must have been very difficult. There are no traces of any barracks or stables – these have just disappeared; perhaps leather tents were used. The fort is roughly square, with a gateway in each wall. There would have been a tower at each corner, with entrances from a walkway that ran round the walls. Outside stood the bath house, one touch of civilisation in what must have otherwise been considered very basic conditions. It is not easy to imagine more than 500 highly organised people living at Mediobogdum, at the edge of a great empire; but they did. Unlike other Roman forts, I don’t think a vicus, a civilian settlement, grew up around it; if it did, it must have been pretty small. 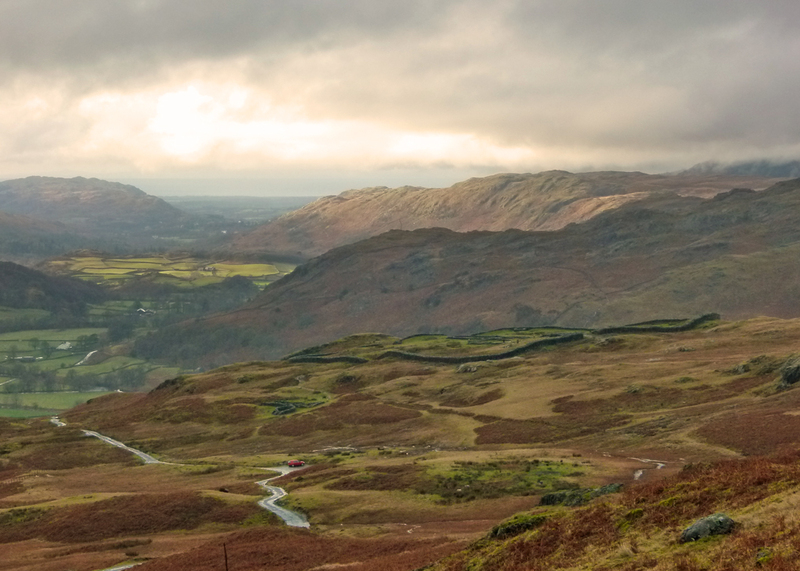 Even now, Hardknott can be a lonely, unwelcoming, place – though the views, if you’re lucky with the weather, are stunning – particularly along Eskdale and north to Scafell Pike, England’s highest mountain. You can, of course, walk there; this is the Lake District; walking is what people do. Some, for reasons best known to themselves, choose to cycle, though that strikes me as silly and unnecessarily energetic. By far the easiest method is to drive – either up from the coast, or from Ambleside. The latter partly follows the old Roman road and is a spectacular route, but not for the fainthearted – a single track, with passing places, that snakes its way around hairpin bends and up/down slopes where the gradient is 1:3 (33%). At times, the car bonnet will, unnervingly, rise up and completely obscure your view of the way ahead – which can be pitted with perilous pot-holes; and at times your wheels will be rather close to the edge. It is a treacherous road in bad weather and you should not even consider it in those circumstances. At the very least, it is not the sort of place you want to be stranded – anymore than those poor Dalmatians did, I guess. Take the A593 in the direction of Coniston. About 1 mile after Skelwith Bridge, take the minor road on the right signposted for Little Langdale. Stay on this road over Fell Foot Bridge and ascend Wrynose Pass. 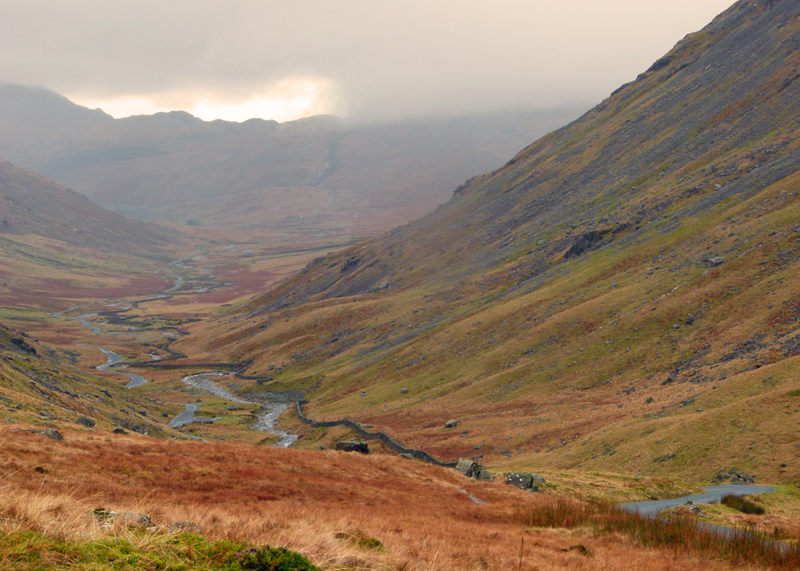 The road will then take you through Wrynose Bottom before ascending again up Hardknott Pass. 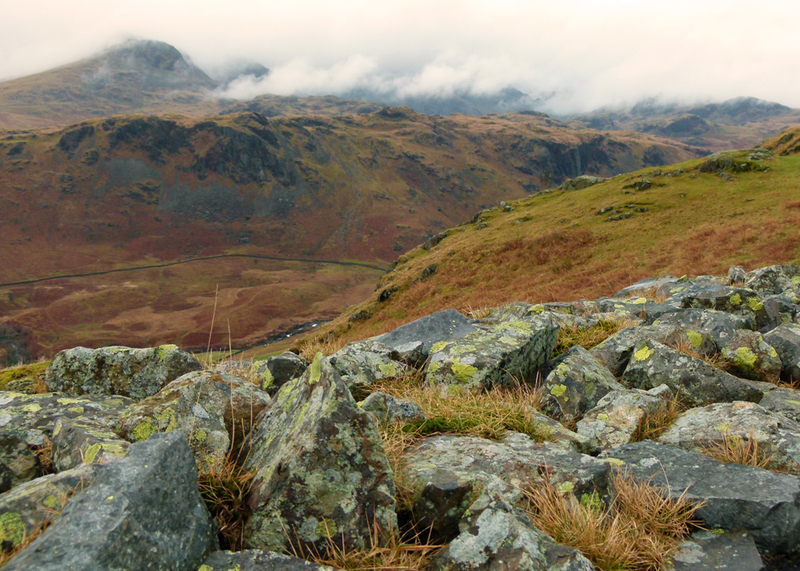 You will see Hardknott Fort on your right as you come down. There is a small parking area, but no other facilities. The ground is invariably extremely wet; take boots and suitable warm, weatherproof, clothing. I was up there in summer 2018 and with clear skies and sunshine it was spectacular. My friend was driving his car to it and it really was a white knuckle ride. Have there been any significant finds in the area of the fort, surely 500 soldiers garrisoned there must have left behind a lot of equipment, coins etc? Has it been properly excavated by English Heritage, it would make a good programme for Time Team. It’s been a while since Ive blogged but nice to see what you’ve done to your amazing page. I’d thought I’d check this post out as I remember walking up it from the phone box at the bottom of the hill in my “Wainwright” days, sorry to say I’ve never been back to Eskdale in the last 15+ years. Thanks for the history and information which reminded me why Romans couldn’t stomach such terrain and would no doubt hire locals to do it for them. So lovely! Have a wonderful week! Glorious scenes. That fine photo of cloud covering Scafell Pike taken from Hardnott Fort reminds me of a climb I did over the Scafell’s years ago. True mountain grandeur, all the better for the dramatic cloud cover. I will keep coming back for another look at these pictures. Such stark beauty. I love your photos and the history. I’m betting my husband would love to get a telescope out in such a sparely inhabited area, providing a clear evening could be had! That landscape is so serene! It’s lovely – but sometimes a little harsh – hank you for popping in and leaving a comment! It’s a bit of an unfortunate name for both the fort and the garrison of men there, but the scenery is stunning. It reminds me of the Brecon Beacons in Wales. Mediobogdum, that is some place name, I wonder how it was arrived at. It certainly is a beautiful part of the country. I would love walking but I wouldn’t do that drive. We have cyclists like those down here, lots of them. Lovely photos. Intrepid. That’s the word that comes to mind, for both the Romans and current trampers scampering over those areas. Insert link here: “https://theperimeter.uk/2017/12/01/day-165-ravenglass-to-wastwater-via-scafell-pike/.” target=”_blank” rel=”noopener nofollow”>https://theperimeter.uk/2017/12/01/day-165-ravenglass-to-wastwater-via-scafell-pike/. I applaud your efforts, Mike, and great fotos. I wonder what it’s like in the summertime? Breathtaking, no doubt. I also sometimes wish that ancient place names stay the same as often they sound more romantic, and probably more accurate descriptively of the place, than modern names, eg Alavana as opposed to Watercrook. Hardknott just doesn’t do it for me! Perhaps the subject for a future post, Mike? This WAS the summertime 🙂 Actually, subject to visibility, I think it’s spectacular at any time of year. I will be writing about place names sometime! Also, I look forward to the place names post. It will be very interesting. Thanks. Cheeri-pip. Dalmatian soldiers in Roman Britain:) who knew:) thanks for this post! Roman soldiers came from all over the Empire, but I don’t think they were posted anywhere near their homes. I’ve been over that pass a couple of times but never visited the fort. A recent programme about the ‘middle country’ Southern Scotland, Cumbria, Northumberland etc compared it to modern Afghanistan with various warlords taking control of regions similar to a snapshot of Britain after the Romans left. Still looks a grim spot in bad weather, probably why we never stopped to visit as going over the pass was a wet weather alternative to hill -walking. Interesting facts. Yes, I saw that programme; interesting – not sure I bought all of it, though. I know I’m going to sound very callow and American but I get such a thrill thinking about the ancientness of this place and all that has happened there, even as remote as it is! Your photos are spectacular–what austere beauty. I’d love to visit this spot, although the approach sounds terrifying! Thanks, Kerry – don’t let me put you off; I probably made it sound worse than it is! Such a bleak but beautiful place! I wouldn’t want to stay there in all weathers though and I have a lot of sympathy for those poor Dalmatians. I probably have more sympathy for the native peoples whose way of life the Romans disrupted so badly. Fantastic photos, MIke! Yes, what did they ever do for us, eh?! Sorry to lower the tone, my first dog was called Measles and was a Dalmation. 50 years later I still could not read this without thinking of him. The views ARE stunning! I find history fascinating, and Roman remains are especially interesting, as they are a mix of “standard” (as you say, the layout of each fort was nearly the same as that of all the others) and – more or less successfully – adapting to geological and climatic conditions. I love the thrill of that road jouney up from Ambleside, but on our last visit my husband said “never again”. Wonderful potted history you have given here – I never cease to be amazed by the feats of the Romans. Thanks, Rosemary; they certainly got around, didn’t they?! I wonder why they built the fort in such a remote place – I’m assuming it was just as remote 2000 years ago. It could not have been an easy place from which to subdue the natives. The hills and mountains would provide ample opportunity to attack a supply column from Ravenglass and it was much shorter to go through the hills rather than round them, so I’m guessing a fort would enable the Romans to offer protection to their supply lines. That’s sensible. I’ve only flown over the Lake District, so I have no idea what it’s like on the ground. Good question. There has been some restoration work, though there’s still not a lot to look at, as you can see. If you look at the photo of the stone wall, Martha, I believe the section above the line of slate was restored in Victorian times. Those are haunting pictures of that landscape! P.S. You were right about Meaford. Hard to believe the Romans tried to establish themselves there and easy to see why they gave up – even with the stunning views. Great outing ! ahhhhhhhhh, makes me want to get the bicycle out. Most interesting. A friend proudly took us over Hardknott Pass when we were on a visit, and the countryside is wonderful. However, as scary passes go it doesn’t hold a candle to some of those in our high mountains, as we subsequently proved to him. I’d love to see the fort, but as soon as the elevation rises and the road narrows, I’m out of the car and walking. Buttertubs was bad enough. I just barely survived that one. I’ve read about Hardknott Pass. Twenty five years service! I would think that even amazing views couldn’t make up for that landscape and climate.